Madcap England 'Dylan' Men's 1960s Mod brushed wool blend dogtooth trousers. Inspired by Bob Dylan's dogtooth suit from circa 1965, this fab Retro brushed wool fabric blends a seasonal colour palette of browns and greys to create an awesome Vintage textured Men's slim leg trouser. Tailored Mod details include the button tab waist fastening, reverse jetted pocket detail and the chunky belt loop feature. 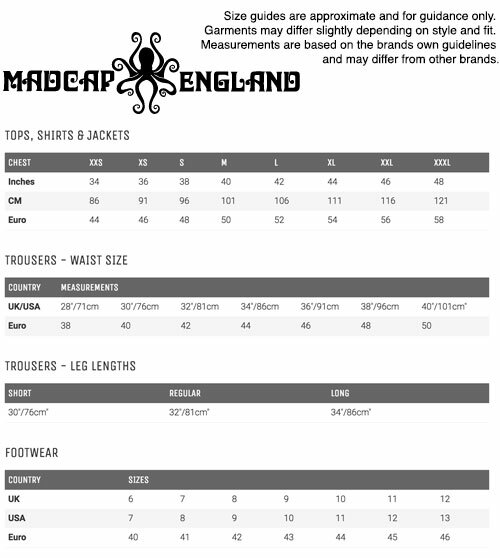 'Dylan' by Madcap England are fantastic tailored Mod suit trousers that are sure to add a dashing and debonair edge to your Mod ensemble. 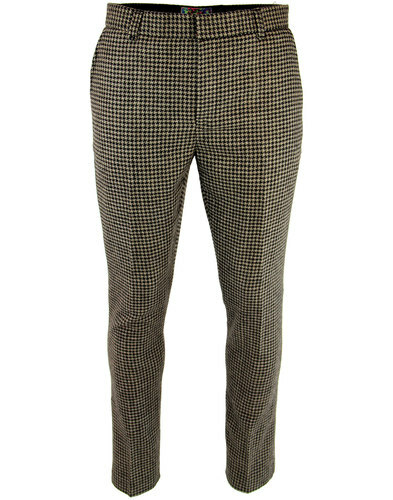 - Madcap England 'Dylan' men's 1960s mod dogtooth trousers. - 2 slant front pockets. - Button and tab fasten waistband. - Chunky belt loops to waistband. - SKU: MC292 Brushed Dogtooth Trousers. Regular leg. Approximately 32 inch inside leg. Madcap England 'Dylan' Men's 1960s Mod brushed wool blend dogtooth waistcoat. 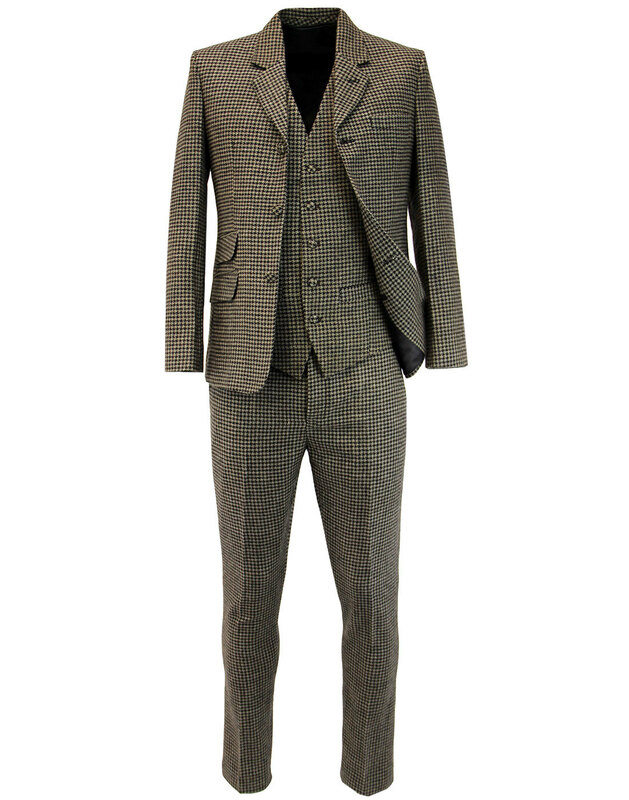 Inspired by Bob Dylan's dogtooth suit from circa 1965, this fab Retro brushed wool fabric blends a stylish colour palette of browns and greys to create an awesome Vintage textured Men's Mod V-neck waistcoat. Tailored Mod details include the tab adjuster to sateen reverse panel, fitted seams to front panel, covered buttons and classic side pockets. 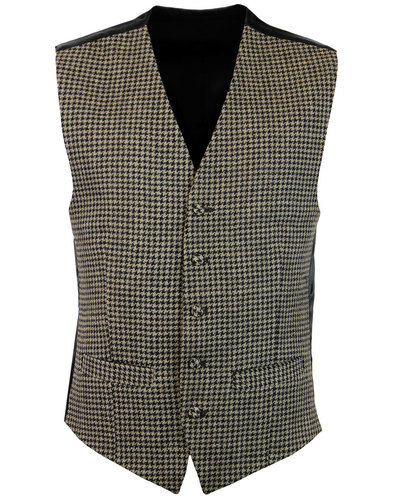 The 'Dylan' Men's Retro dogtooth waistcoat by Madcap England is sure to add a dashing and debonair edge to your Mod ensemble. 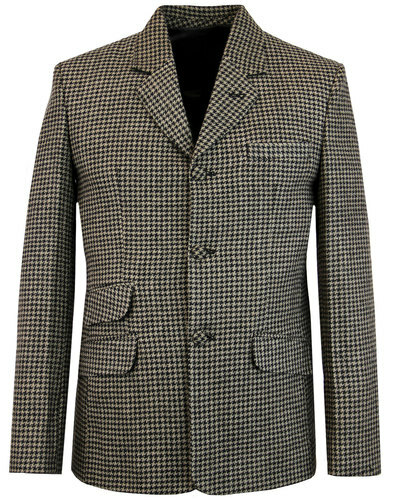 - Madcap England 'Dylan' men's 1960s mod dogtooth waistcoat. - Sateen like back panel in black with retro tab adjuster. - 5 covered button fastening..
- SKU: MC292W Brushed Dogtooth Waistcoat. Composition: Poly/Wool blend. Lining and back panel: 100% polyester. Slim fit V-neck waistcoat. Please choose chest size to fit.